Basic hydrologic data collection, processing, analysis, dissemination, and archiving are major parts of the California Water Science Center program. Streamflow data, for example, are used for flood and water-supply forecasts, planning and design, river regulation, streamflow statistics, and research investigations. Much of the data are available on a near-real-time basis by satellite telemetry. Current California Streamflow Conditions map depicts streamflow conditions as a percentile, which is computed from the period of record for the current day of the year. Real-time streamflow data from automated equipment, representing the most current hydrologic conditions. WaterWatch displays maps, graphs, and tables describing real-time, recent, and past streamflow conditions for the United States. Shows real-time current California conditions including surface-water, groundwater, spring sites, atmospheric sites and more. California Active Groundwater Level Network contains water levels and well information from more than 20,000 wells that have been measured by the USGS or USGS cooperators at least once within the past 13 months. 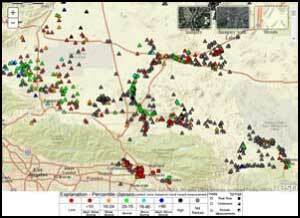 The Groundwater database consists of records of wells, springs, test holes, tunnels,drains, and excavations. Available information includes groundwater level data, well depth, aquifer, and more. Groundwater Watch groups related wells and data from active well networks reported in the USGS National Water Information System (NWIS), and provides basic statistics about the water-level data collected by USGS water science centers for Cooperative and Federal Programs, and from data supplied to us by our customers through cooperative agreements. National aquifers, or principal aquifers of the United States, are defined as regionally extensive aquifers or aquifer systems that have the potential to be used as a source of potable water. State and local "networks" are defined by Water Science Centers as a way to group specific collections of wells. These "networks" have a variety of criteria including political divisions, principle aquifers, cooperators, and water management districts. NWIS Surface-Water Data offers hydrographs, by site, for termperature, disharge, gage height, and specific conductance. 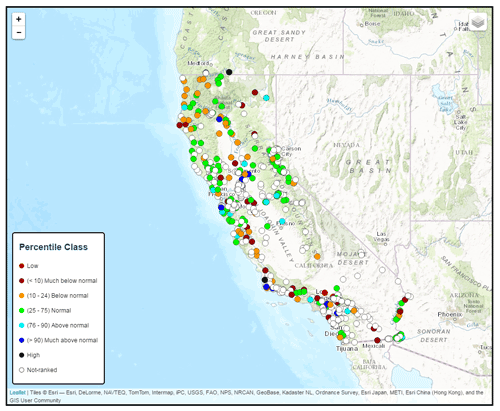 The Surface Water database consists of records of current streamflow conditions, historical observations, daily data, peak-flow data, and field measurements from streamgages across California. Maps California streamgage sites and compares real-time streamflow to historical streamflow for the day of the year. Monthly and Annual excess precipitation discharge estimates for California, including historical comparisons. GAMA-Priority Basin Project Groundwater-Quality Results mapper displays water quality results for constituents of interest that have health- or non-health-based benchmarks, or are key tracers of groundwater age. Data from automated field equipment representing the most current hydrologic water quality conditions. This interactive webmap plots water-quality data from domestic and public-supply wells sampled by the USGS for the California GAMA Priority Basin Project, and allows users to download datasets. The Site Inventory System contains and provides access to inventory information about sites at stream reaches, wells, test holes, springs, tunnels, drains, lakes, reservoirs, ponds, excavations, and water-use facilities. Excerpt from Water Resources Data California Water Year 2003 showing the location of USGS discharge and water-quality stations in Ventura County for Water Year 2003. Hydrologic Data Reports for Water Years 1961 thourgh 2013, including surface and groundwater data, water quality data, and basin schematics. Get current-conditions for water data directly to your mobile phone or email. Training information and guidelines for Federal Energy Regulatory Commission (FERC) licensees and other cooperating agencies for the preparation of furnished data records.